Previous blogs described how to make and use a DIY steadicam with HandlePod, PVC pipe and other parts. The addition of the gimbal and then the roller bearing added to the cost and made construction slightly more involved. Each version of the steadicam has its pros and cons. The following is a comparison of the construction involved in each and the effect that additional features have on performance. The simplest steadicam design is supported by hand. This is the simplest and least expensive steadicam design. It can be made for $3 to $6 worth of parts. The PVC pipe cutter is the only tool needed. It should go together in about five minutes. With the counterweight (in this case steel nuts or any small metal bits) added and the HandlePod attached with the elastic cord you are ready to mount the camera and shoot. Balance is simple as long as the counterweight is slightly more than necessary to just balance the weight of the camera. Place two fingers on the horizontal bar beneath the camera and hold the steadicam very lightly at the balance point. The steadicam should remain upright. If it leans left or right, turn the camera mount to compensate. You can walk and move the steadicam smoothly and the camera will appear to float and not shake. This basic version has the advantage of allowing you to grab the steadicam more firmly to tilt up or down or pan the camera as desired. The disadvantage is the fact that you are holding it by hand and unintended or too rapid hand movement can detract from the steadicam effect. But given its cost, ease of construction and simple use, this basic version may be all you need to begin shooting steadicam video with a bare minimum of expense and effort. A gimbaled handle added to the steadicam further isolates hand movement. The addition of a gimbal isolates hand movement from the steadicam. It can be made with a Traxxas #5151 half shaft and U-joint as described in the previous blog. This adds about $8 to the cost. Use of a gimbal makes balancing more critical. It can be done quite easily, however, by shifting the position of the camera and rotating the camera mount as detailed in the blog on balancing. The gimbal isolates hand movement from the camera and results in smoother motion. However, it is not easy to tilt the camera up or down as it is with the hand supported version. And the gimbal alone does not prevent panning movement which may be jerky or too rapid with wrist motion. But adding a gimbal is well worth the additional cost and effort to build it. Steadicam with roller bearing and gimbal. Horizontal panning motion can be dealt with by adding a roller bearing to the gimbaled handle of the steadicam, This final improvement completely isolates hand movement from the camera. But it makes the steadicam harder to aim and control. Using it takes a bit of practice to master. A package of bearings will run $4 to $12 depending on the quantity and type. But it is a valuable final addition to the DIY steadicam. 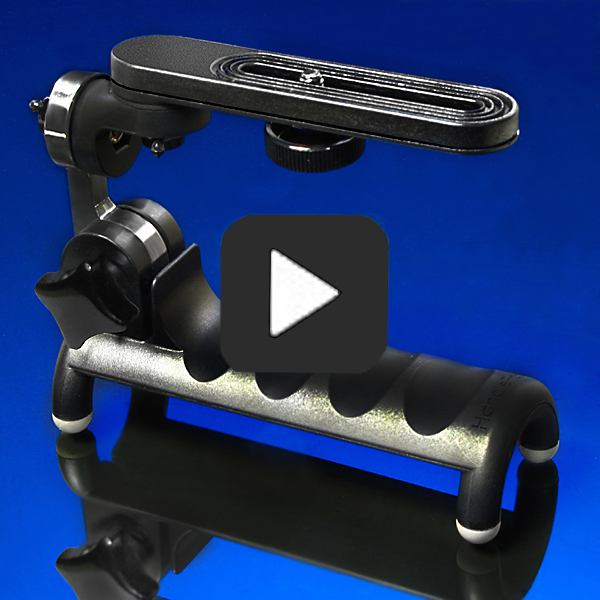 The HandlePod DIY steadicam can be as simple or complex as you want. You might start out with the simple, hand held PVC only version. It is easy to add a gimbal and roller bearing later on if you find you want better performance. Either way you will find that shooting with a steadicam, even the simplest, cheapest DIY version, will give your video an impressive, professional look. This entry was posted in Camera Stabalization, Shake Free Video, Tripod Alternative on February 3, 2015 by main user. Hi,I check your blog named “Three Versions of the DIY Steadicam” regularly.Your writing style is witty, keep it up! And you can look our website about love spells.